As students continue their study of Oregon history, this lesson plan—with a primary source document from the Historic Oregon Newspapers website—provides another connection between students and Oregon history. This lesson plan uses an article that was submitted to the Sunday Oregonian newspaper in 1906 by a reader, and as such, provides students with exposure and experience with primary documents, authenticating the history they are learning. The type of story the reader has submitted is an animal myth, much like a fable but without a moral to be taught. This lesson can supplement any unit under the fiction literature theme with a variety of opportunities for extensions. Some extension ideas are presented below. ELA.W.4.3 Write narratives to develop real or imagined experiences or events using effective technique, descriptive details, and clear event sequences. ELA.SL.4.4 Report on a topic or text, tell a story, or recount an experience in an organized manner, using appropriate facts and relevant, descriptive details to support main ideas or themes; speak clearly at an understandable pace. Introduce article: Go over key features of text such as title, author, page number, publication date, newspaper name, etc. A basic text feature comprehension sheet is provided in PDF Download. Note: There are quite a few stories on this page; you may want to ask students to highlight which portion they will be focusing on. 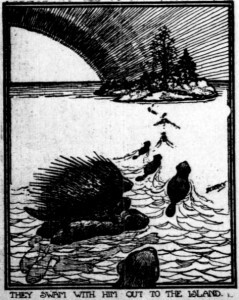 The article to be focused on, “When the Porcupine and the Bears Quarreled,” is found on the right side of the article about halfway down the page. Say the title out loud. Where is the publication date? In addition to discussion about text features of the article, have students make predictions about the story. Give students time to think of a prediction and then share with a partner, the table, or the whole class. This may be a wonderful opportunity for students to have a short discussion about what animal myths they know, including animal myths from different parts of the world. Read the story: You may want to read the story several times because the vocabulary and sentence structure are different than that of today. You may also want to introduce some vocabulary words prior to the reading. A list of possibly difficult vocabulary words is presented above. After students have read the story once through, whether in groups, pairs, or individually, have them retell the events of the story to ensure comprehension. This may be adapted using the comprehension worksheet provided in PDF Download, or have students retell the story orally to each other. Closing and debrief: Once students have finished the comprehension sheet, gather and debrief. What did you think about the story? What were some interesting points of the story? What were some boring points of the story? How do you feel about the language of the story? Activities can be modified several different ways depending on grade level and focus of study. Listed are some activity ideas that can be adapted and extended to and for any grade level. Create Animal Myth Story: Students choose an animal and make up a story about how that animal was created. Once students have created their stories, have them present their stories to the class, since many animal myths are part of the oral tradition of storytelling. Additionally, students could create a book illustrating the evolution of the animal. Reader’s Theater: Though the stories presented in this article do not have characters to portray as in a play, students can still practice their oral reading skills by choral reading the stories to their classmates. Dictionary Skills: An important skill for students to have is the ability to utilize resources to find the meaning of words they do not know. Instead of introducing difficult vocabulary, have students use the vocabulary definition sheet (in PDF Download) to look up the words in the dictionary. The activity sheet requires students to write down the guide words, definition, and create their own sentence. Blank sheets have been provided as well.